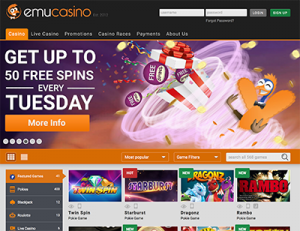 Emu Casino is a bright, vibrant online casino offering hundreds of online casino games in an instant-play setting accessible via Web and mobile. Emu has been around for a few years now, and while it initially catered especially to Australia, Emu now accepts players from many countries around the world. After undergoing a major makeover in 2015, Emu Casino has become a leader in the real money gaming field and continues to stay ahead of the pack by keeping a finger on the pulse of new games, new software developers and exciting bonus offers. What kind of player is Emu Casino for? Emu Casino is a great casino for the young at heart – it’s colourful, cheerful and overseen by a friendly little emu mascot to help brighten your day. It’s a multi-provider casino, offering 900+ games from over 10 of the best game developers, all of which are available directly over your Web browser. Several currencies are accepted, including AUD, USD, CAD, GBP, EUR, NOK and SEK, with payments available using trusted deposit methods. Emu Casino is suited to a wide range of players as the gaming catalogue is extensive, offering hundreds of online slots, a large selection of table games, niche number games, live dealer games and virtual sports. Emu Casino does not accept players from Belgium, Denmark, Malaysia, France, Italy, Spain, South Africa, Turkey, Israel, United Kingdom, United States or any United States territory. Free spins on registration – Sign up for an account at Emu Casino and you’ll be treated to 12 free spins right off the bat, with no deposit required. 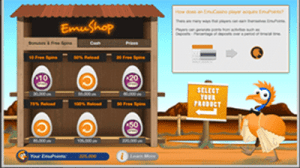 The free spins can be used on a selected slot game of Emu’s choice, and are subject to a 25X play-through requirement before any cash winnings can be withdrawn. Sign-up bonus – New players who sign up for an account with Emu Casino and make a real money deposit can claim up to $300 in bonus money. The bonus money is spread over your first three cash deposits at the casino, with the match percentages depending on where in the world you’re playing from. For example, Australian and New Zealand players can claim a 100% match up to $100 on their first deposit, 50% match up to $100 on their second deposit and 80% match up to $100 on their third deposit. The bonus is only available once per customer and subject to wagering requirements. Check the promotions page at EmuCasino.com for the full details about the welcome bonus available in your country. 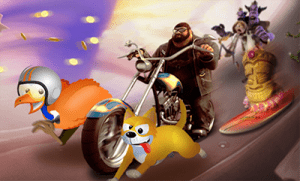 Emu Casino Races – Exclusive to Emu Casino, the Emu Casino Races are simple competitions/tournaments which allow player to win even more when playing real money slots online. Typically, races are won by being the player who places the most spins on a slot game within a certain time frame, with the winner claiming an additional prize on top of any of their slot winnings. You can see which races are currently underway by going to the ‘Casino Races’ tab on the Emu Casino home page. The loyalty reward program at Emu Casino is known as Emu Points, and we love this program as it veers away from the same old loyalty format used by most online casinos and offers all kinds of ways to earn points. Firstly, when you become a member at Emu, you’ll automatically receive 1,000 Emu Points to kick things off, then for every $100 real money deposit you make, you’ll earn another 500 points and regular players will also get 200 points simply for logging in and playing daily. Points are also accumulated for every real money bet you place on any game, and according to the Emu website, players will soon be rewarded for referring friends, making their first withdrawal and uploading identification documents. Members move up through different loyalty tiers as more points are earned, with the most loyal players and high rollers being eligible for VIP status. Your Emu Points can then be redeemed in the Emu Shop, where you can choose between three different reward categories: Bonuses/Free Spins, Cash and Prizes. Emu Casino is an instant-play casino, which means all games are available directly over your Web browser (Safari, Chrome, Firefox, Explorer, etc) without having to download any software. You will need Flash enabled on your computer, which most computers have, but it can always be downloaded for free from the official Adobe website if required. Games are compatible with PC, Mac and data-enabled mobile devices, and according to Emu, as long as your system was purchased within the last five years, isn’t running too many programs at once and has a solid Internet connection, you should encounter no trouble accessing games. You can view the detailed system requirements at EmuCasino.com. Emu Casino offers 900+ instant-play casino games from leading software developers including BetSoft, NetEnt, Microgaming, 1×2 Gaming, Multislot Gaming, Rabcat, Leander Games, Playson Games, Oryx Gaming, GameArt, iSoftBet and Evolution Gaming. Games are broken down into clear categories, making it easy to find exactly what you’re looking for, and you can even search by game theme or software developer if you’re looking for something specific. You’ll find everything at Emu from classic table game variants to niche number games difficult to find elsewhere, including one of the most varied selections of online keno available at any of our recommended sites. Overall, there’s a really comprehensive collection of games here, and chances are you will definitely find what you’re looking for at Emu. All deposits are processed instantly so you can start playing games for real money straight away. Bank deposits may take a few days to hit your Emu account, depending on the terms and conditions of your financial institution. When it comes time to withdraw your winnings, you can withdraw using any of these deposit methods except for Paysafecard and Flexepin e-Vouchers. Withdrawals via credit card are typically processed within one business days, while bank transfers can take up to seven days to hit your account. You will also be required to provide proof of identity before any withdrawals can be approved. Emu Casino ticks all the right boxes when it comes to licensing and security. It is fully licensed by Curacao e-Gaming, one of the leading jurisdictions for online gambling, and is audited by eCOGRA on a monthly basis to ensure payout rates are fair and unbiased. The casino is protected by 256-Bit SSL (secure socket layer) digital encryption security to protect all player payments, while all financial affairs are conducted in accordance with internationally recognised guidelines. Emu believes in offering complete transparency about all of its services, and you can find detailed information under the ‘Security & Ethics’ page at EmuCasino.com. The welcome bonuses cater mostly to Australian and New Zealand players – players from other countries still get sign-up bonuses but they’re not as lucrative and are subject to higher wagering requirements. The Emu Points rewards system offers a fun new spin on the standard online casino loyalty proram. Emu Races give slot fans a chance to claim additional prizes on top of their slot winnings. The ability to search by game theme (spots, fantasy, adventure, culture, etc) is a great feature for those with specific tastes. Emu offers full transparency when it comes to its security, licensing and ethics – a big plus in our books. The site is available in both English and Swedish. Sign up at Emu Casino to claim a welcome bonus of up to $300 when depositing real money to your account for the first three times.